@Darksoft ...and now problem...I do not have sound ?! ?...in menu, in games,..nothing! I tried a dozen ROMs with the same result. But I have no problem with my original cartridges! 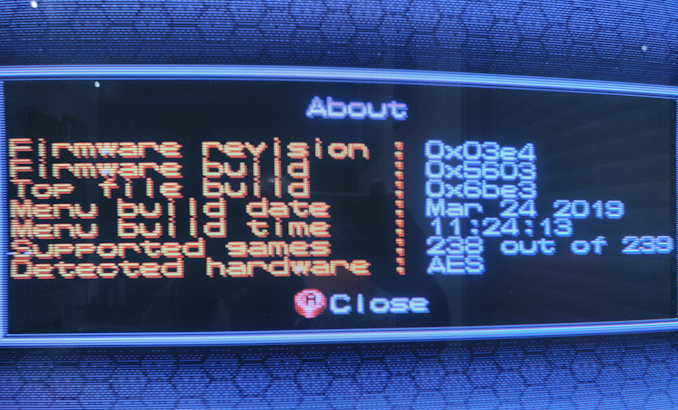 My config: japanese AES (first revision) with original BIOS. The sound comes from the jack output on the front of the console and go to the SCART. Is there a relationship? I will try to get my hands on my "classic" SCART cable to test. 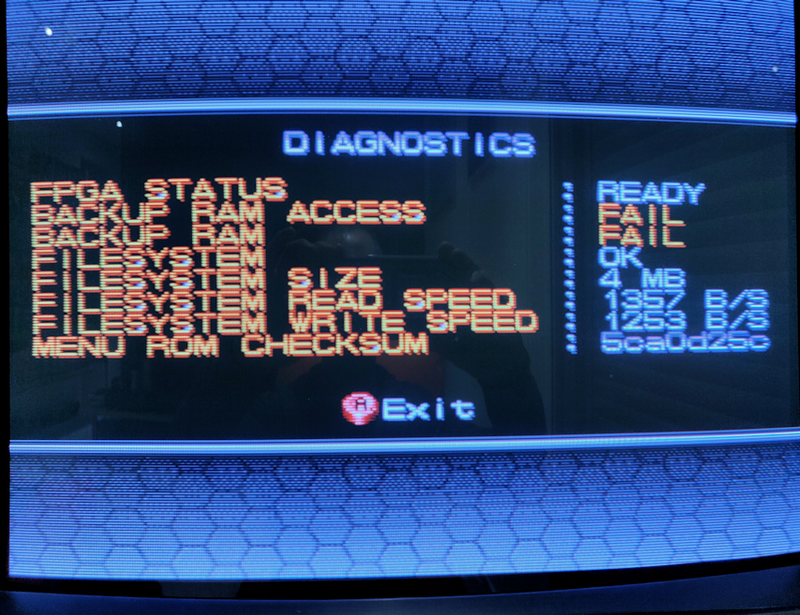 Except the sound, all seems to work properly but I have 2 "FAIL" in the cartridge "Diagnostic Menu"
Have you tried to update the menu or FW? I suspect you have a mismatched pair right now. The menu released the other day works on both the MVS and AES but the FW for AES and MVS is different. I don't think we have placed the latest FW anywhere to download yet. Let me check. But I just saw that I did not delete the BUFF file before inserting the microSD...but in fact, there is no BUFF file in the archive !? The post was edited 1 time, last by Samy83 ( Mar 27th 2019, 8:04pm ). Obviously that it shows an error in the Backup RAM, because.....the AES has no Backup RAM! Newest menu has date from 24th of March. Is that showing in the section about from the menu? After installing please delete the BUFF file. There should be one. Let us know which version of Menu you have. Also let us know which serial number and revision of AES you have please. VERY IMPORTANT!! THE FIRMWARE FROM AES IS NOT THE SAME AS THE ONE OF MVS. It's not like you will break anything but your cart will stop working until you update to the right one again, so don't touch it please. My 2 cents here since I got my multi AES today ! Since I restore my original BIOS, all gone. So far didn't test my Unibios, need to send back to Razoola for update. Quick one, does the Multi AES setting for region works ? Cause even if I set to Japan, still white blood. Should I use Unibios ? Thank you, and congratulations for amazing work !!! which version of Unibios was that? did you update the menu and delete BUFF file? Region setting works well, with or without Unibios, so something else is going on. Please post always the revision (if you can) and the approx. serial number of your console. BUFF file deleted. Still no sound except with my original games. menu looks good let me check here in a similar board. That serial is very low so I think I know what might be going on here. What power supply did you have? First of all thank you for this great product ! I have some problems with games's options (difficulty level, time of a round, number of life, keys mapping). Like Samy83, i use the last menu (24/03/2019) and the last Neo Geo Roll-Up Pack (there is 2 "Neo Geo Roll-Up BETA 3.1 2019-03-04.7z" file on MEGA... i got the 21H17 one). When i play Metal Slug X, The number of life is set to "F" (? ), all the keys (shoot / jump / ..) are on "A" for both players, difficulty level to easy. When i play Garou MOTW, difficulty level set to 1 and only 1 round to win. When i play FFS, i only have 5 sec for each round. I tried deleting the BUFF file, but it did not change anything. Whenever I restart a game (switching with "Start+Right/Left/Up", reseting or turn the power off/on), the options return to these strange values. I'm using a debug bios like iori. I also had some graphics glitch in the main menu at first, but it does not seem to do it anymore. The first start of the cartridge was done with the menu files os the SD card. At the first flash, only the first game was OK (first slot only), then I had a black screen. I waited 5 minutes before restarting the console. Only the first game was flashed. I did not have the same problem after that (next 8 or 10 times). HO WAIT.... I don't have those options problem when i set the type to "Normal Home Use" in the debug bios menu. By default, the option is set to "Devel.Home Use". I don't have those problems with original cartridge in Devel. Home Use. The post was edited 2 times, last by DoubleM ( Mar 28th 2019, 7:20am ). @Darksoft can say for sure but it sounds to me that if the AES Multi isn’t working with your AES Debug BIOS then you should change to the stock or UniBIOS instead. I don't have those options problem when i set the type to "Normal Home Use" in the debug bios menu. Edit : I have to set "Normal Home Use" in the Debug Bios AND "AES" in the Multi-AES so that everything is OK. The post was edited 1 time, last by DoubleM ( Mar 28th 2019, 7:23am ). This bios kit is intended for use with the AES (home cartridge system). For now please use it as @DoubleM described. In Normal Home use and AES mode. We'll have a look at it to understand what is really going on here. It looks like that Debug Bios was created loooong ago, even before Unibios. I got information from other users. We are not going to support this BIOS as it's old, buggy and discontinued. Please install a UNIBIOS or an original BIOS. @Darksoft Have you had time to work a little on my sound problem? The post was edited 1 time, last by Samy83 ( Mar 29th 2019, 9:24pm ). 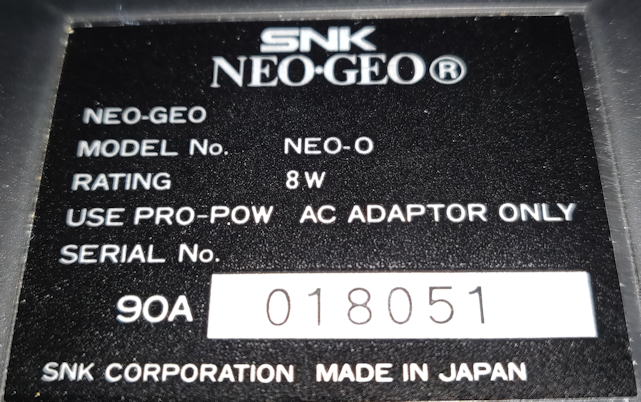 I have the exact same problem as Samy83 : low serial 5V NeoGeo (sn = 24586), no sound at all. This console has a Unibios 4.0 and works perfectly with original games, and MVS games through a Phantom-1 MVS converter. I tried with 2 multi AES carts, both with last menu update. Those 2 Multi AES carts works pperfectly on another AES console I have (10V, higher serial). Please be patient we are working on a fix for those low serial number.